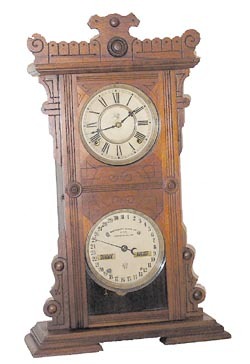 Waterbury Clock Co., "Calendar No. 44", ca 1891. The refinished walnut case is 24 inches high and extremely clean. Several labels on the back, 75% to 90% intact. Original dials, hands, and pendulum. 8 day, half hour gong strike, running real strong. This is a very clean clock, ready to put in your collection or resell. Ly-Calendar No.709.